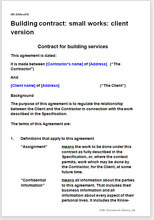 This construction contract is a document to protect the client. It is for the client to buy and use. It is a basic straight forward construction contract for any small works at your home, office or factory. Use it with sole trader or company. Makes clear the self employed status of the contractor. Allows you to define the work to be done and make sure it gets done. Takes some of the risk out of using an unknown firm. Provides for use of sub-contractors, high level confidentiality and many smaller points.